The surfing line up is an intricate mix of characters, egos, abilities, desires and ages. From the beach an untrained eye may just observe a bunch of surfers, but the social structure is much more complex than that. One of the best things about surfing is meeting new people, but let’s be honest, there’s no shortage of douchebags out there as well. Here are some of the characters you may meet in the Costa Rican line up….. The wave hog rides nothing under 10 foot 8 and paddles for any wave over half an inch. He moved to Costa Rica to start a real estate agency and despite his widening girth, arthritic hips and goutish legs he still manages to clamber up onto the board. Don’t be fooled by his Father Christmas beard as he snakes past you, he has a deeply entrenched sense of entitlement and will use the size of his board/boat to take your waves. Should not be mistaken for a genuine crusty. He fancies himself as an elder statesman of the town, and try to avoid the speech that starts with “I’ve been living here for over 20 years ….” He’s had such a grumpy expression on his face for so long that his face now looks like a scrotum. He lives in a beachfront house called ‘Upyourownarse’. The grommet is the only person catching more waves than the wave hog. Typically the grommet rides shortboards around 4’6. The grommet can surf for hours and never get tired or need water or sustenance. He or she will make you feel like an old carthorse on the way to the knackers yard. They travel in packs and will happily drop in on you. However you like them because they are always enthusiastic and smiling and have a good vibe. 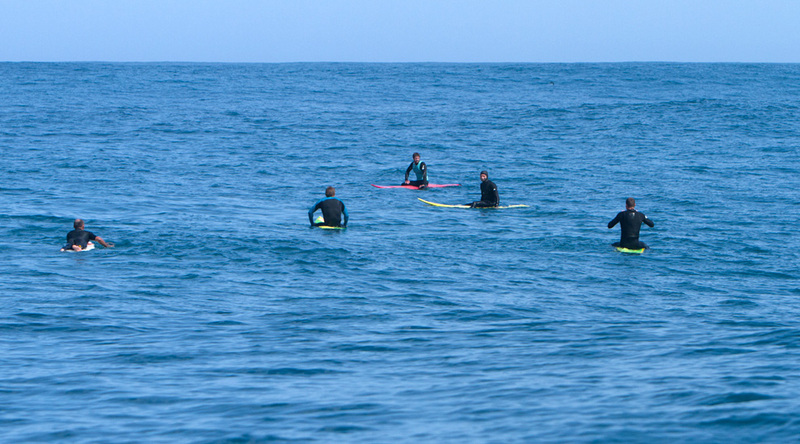 There are many different species of male surfer instructor. But the one potentially dangerous species comes with a bronzed lizard-like body, a charming smile, eyes like the ocean, and carefully tousled hair like George Michael’s in his Careless Whisper days. He preys on hapless young female beginner surfers, offering to take them under his masterful wing, and trips to ‘secret’ waterfalls. He doesn’t represent a threat to other surfers because he’s too busy flirting. Also his partying habit and heavy drinking means he lost his edge a long time ago. The last time he caught a good wave was when Agadoo was in the music charts. The hippy surf mama does sun salutations on the sand and chants three OMs before entering the water. She cuts a stylish figure in her Yves Saint Laurent bikini and 7’2 rainbow colored mini Malibu surfboard. Her husband is an oil executive, but when they’re at their second home in Costa Rica (gated, obviously) it’s all barefoot living, daily yoga and colon cleanses. She can’t spend too long in the water because she needs to drive one kilometer in her giant SUV to pick up her kids Tallulah and Tarquin from the Montessori nursery. Also she needs to speak to her publisher about her new book ‘Earth Mother: Raw Food in the Jungle’. The trustafarian is a highly skilled surfer, mainly because of the amount of spare time he or she’s had to hone their craft. This person literally just surfs, eats and sleeps. Daddy owns Ikea, or an investment bank in Boston. The trustafarian is mild, super chill, well-mannered and fun to surf with. He or she usually smokes a bong before surfing, and then relaxes after surfing with a few reefers in a hammock. Male trustafarian surfers always have a man bun. The backpacker is the most dangerous person in the water because taking surfing lessons and learning about ocean safety would have eaten too much into their beer fund. The backpacker has a 6’4 shortboard, because it’s “easier to carry than those bigger boards”. The backpacker is rarely on his or her board whilst in the ocean, preferring to let the board flail wildly out of control. They are delusional about their own skills and oblivious to ocean conditions. Keep a wide circumference around this character. The girlfriend does not actually surf, but is still a part of the general scene. She is easily spotted because she has the most bangable body on the beach. She looks like she was produced from the mating of panther and baby giraffe because she’s slinky and languid and drop dead gorgeous. It’s imperative to never stand too close to the girlfriend whilst wearing a bikini because the comparison is devastating. Her bikini bottoms are so small that they could be mistaken for a hemorrhoid pad. But it’s a full-time job to look that good. She’s just had her hair keratined again, and the hairs not on her head have to be rigorously removed every week. She has a sultry look on her face that says “I’m really hot and I know it”. The beginner is the happiest person in the water. They don’t have a stylish outfit yet, they bought their boardshorts from Target. Typically they ride a 9 foot blue softtop. Yesterday the beginner managed to pop up and stay on the board for a consecutive 3 seconds. Everytime the beginner stands up a huge smile appears. Even when the beginner wipes out, they come up laughing. It’s not just the surfing part that makes them happy, they love being in the ocean and looking at the beautiful beach and jungle. They just like the feeling. Truly revealing! I know it’s exaggerated or is it over simplified, whatever I could add a few “types” but fact is, it would just make me miss C.R. more than I already do. The real downside of surfing is when life happens to make it so you are unable to surf any more. The hardest part is having to let go with that world that gave you so much many riches and so many great experiences. It was so great to have such a meaningful purpose in life and to share it with others of the same mindset. Pura Vida!